Sometimes, all it takes is a nudge from a friend to get me into the kitchen and experimenting away. My friend Emma wanted to make polenta in her Instant Pot, and the recipes on the internets were less than inspiring. Challenge accepted! Amazingly enough, it only took one try to get a very good result. I brought some chicken broth and butter up to a simmer on the “Sauté” setting, whisked in the polenta, then used the “Porridge” setting to cook the polenta. This was so much easier and hands-off than making polenta on the stove, which requires a lot of attentive stirring. Stovetop polenta also tends to burble up in threatening, molten-hot bubbles, which was nice to avoid! Once the polenta finished cooking, it was creamy and smooth. You could certainly serve it this way, ladled straight out of the Instant Pot. Or for a creamier, more decadent porridge, try stirring in a dollop of mascarpone and some Parmesan cheese. I was in the mood for crispy squares, though, so I spooned the polenta out onto a Silpat (a.k.a. a nonstick silicone baking mat), let it cool for about ten minutes. then cut it into squares with a bench scraper. To get a nice crispy crust on the polenta, I sautéed the squares in olive oil for about five minutes a side. It’s easy to tell when they’re done, as they turn a delicate golden brown. 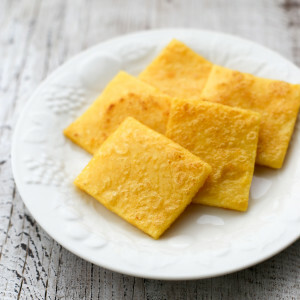 Crisped polenta squares are a great starchy side. You can serve them simply straight from the skillet, or covered in marinara sauce and a sprinkle of parmesan cheese. Enjoy! Creamy smooth polenta porridge is so versatile. Serve it straight up, or fry it in crispy squares. Press the "Sauté" button on the Instant Pot. Add the chicken broth, butter, and salt to the pot. Bring it up to a simmer. When the broth begins to simmer, pour the polenta into the broth in a thin stream, whisking constantly to keep it from getting lumpy. Put the pressure cooker lid on the Instant Pot, and set the valve to "Sealing." Press the "Keep Warm/Cancel" button to reset the Instant Pot. Then, press the "Porridge" button and adjust the time with the "-" button, down to 8 minutes. When the Instant Pot beeps to signal the end of cooking, leave it on the "Keep Warm" setting for another 15 minutes. After 15 minutes have passed, carefully turn the pressure valve to "Venting." When the pressure has fully released, open the Instant Pot and remove the inner pot. Stir with a wooden spoon to unstick any polenta that may be clinging to the bottom of the pot. Taste for seasoning, adding more salt if necessary. 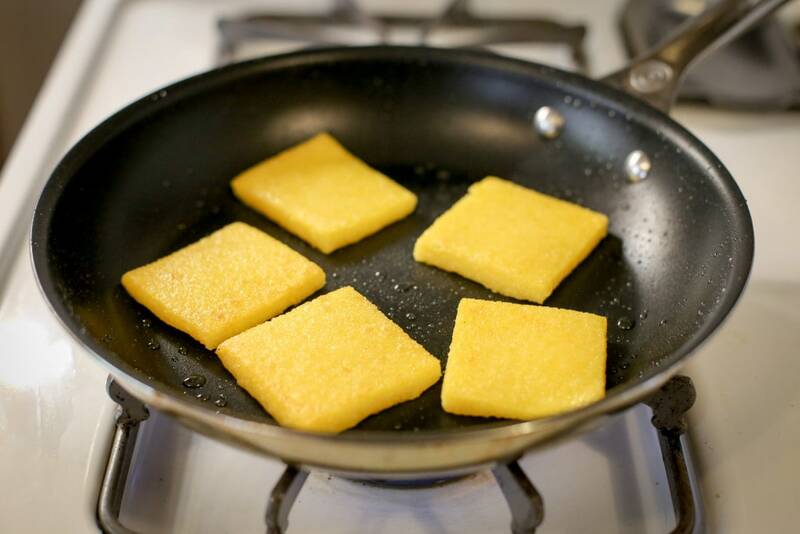 Serve the polenta as a porridge, or spread it out in a 1/2-inch layer on a Silpat, let it cool to room temperature, then slice it into squares and fry in olive oil until golden brown, about five minutes a side. Cleaning Tip: Wash the Instant Pot lid and inner pot right after you're done using them. They're much easier to wash at this point, before the polenta has had a chance to get dried on. 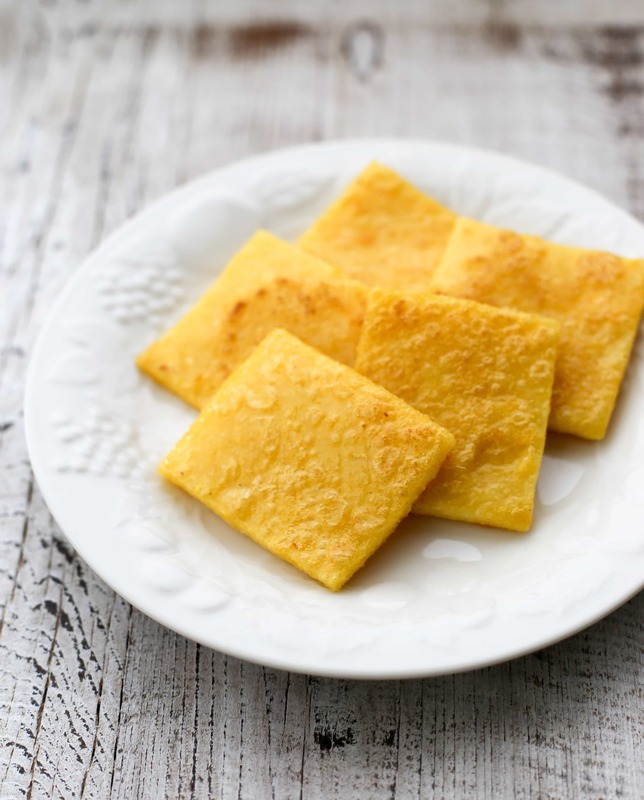 Make Ahead Tip: Once you've cut the polenta into squares, they can be stored in the refrigerator for up to two days before frying. Put them in a tightly-lidded tupperware, with sheets of wax paper between layers of polenta squares to keep them from sticking. This method worked so well! Nothing was scorched on the bottom of my Instant Pot, even though it sat in “keep warm” for more than 35 minutes while I waited for my husband to get home. I added a splash of milk, splash of half and half, and Parmesan-Reggiano at the end. So good! Yum! Half and half and cheese certainly never hurt :-D. Glad you enjoyed it! This was perfect! 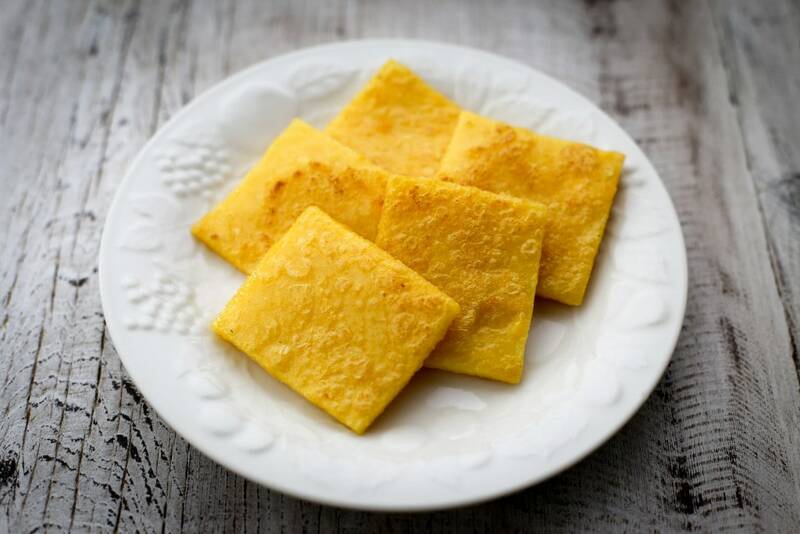 I was looking for an easy polenta recipe that I could make and then waffle the finished squares–my daughter put cheese between 2 slices, and….yummmmm! Thank you. Joelle, you are my kind of person. I love anything stuck in the waffle iron but hadn’t thought of this. Thanks for the idea! My Grandma Vera, from southern IL, would serve cornmeal mush for dinner. Then, the leftovers were put in a loaf pan and refrigerated over night. She, too, sliced and fried it the next morning and served it with maple syrup. What a treat! Such good memories. 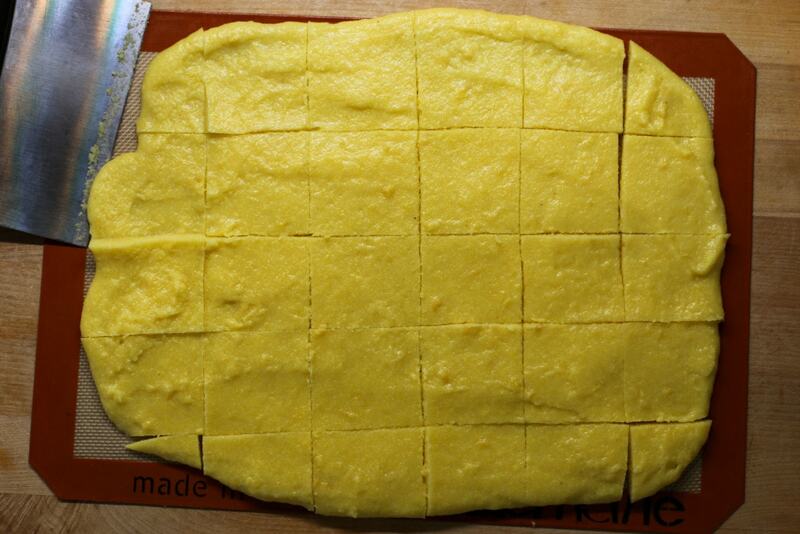 The polenta needs to cool before you can cut it. It will be soft out of the pot, but thicken as it cools. Spread it out while it’s still liquid so you can cut it into squares. I hope that helps! I agree with you Cristina. We cook ours until it pulls away from the sides of the pot, flip it onto a wooden cutting board, then lift the pot to reveal a mountain of deliciousness. We slice it vertically with a thread and top the slices with a thick bacon ragu. I have not been able to achieve the right consistency in the instant pot. I think it’s because there’s no where for the water to cook off. I’m looking for mashed potatoes and I’m getting potato soup. Has anyone had any luck getting a nice stiff polenta out of the instant pot? I like to save my cobs from summer corn and then make stock from them. The corn stock is great for polenta! I made this just as directed. It seemed like there was too much liquid after it was done cooking, but nope. I stirred it and let it cool a bit before pouring it onto the Silpat – it was still runny. It cooled and firmed up perfectly. I cut it into triangles and fried it in a pan with mushrooms and added sauce and these tasted so, so good. And this recipe is so easy. Thank you. I found using the Silpat resulted in too-thin slices so lined a loaf pan in foil and poured the polenta into that to cool/solidify. Worked beautifully and was super easy to slice for frying. Great recipe, thank you!! I’m so happy to have found this recipe! I like polenta but I almost never make it because it’s so much work on the stove. It was so great to let the Instant Pot take care of it! Thanks for posting this! My Instant Pot displayed the “burn” warning almost immediately when I turned it to the “porridge setting. Hmmm, I will wait to see what transpires and hope that it isn’t a big cleanup.I am tempted to turn it off but will tough it out. Same problem here. The error message came up even before the timer started to count the 8 min. What can I do to avoid this? Put some oil on the bottom of the pot? I haven’t had this issue when cooking polenta or using the porridge setting in general. I don’t think oiling the pot will be a big help, unfortunately! 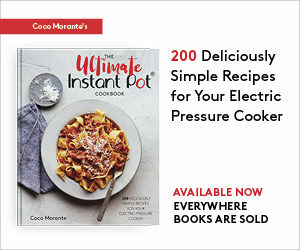 Please contact Instant Pot directly here: http://www.instantpot.com/contact-us I’d be curious to hear what they say back. 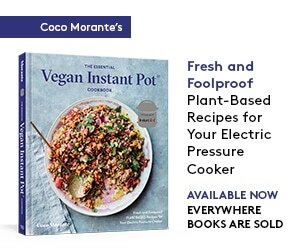 Best of luck, and I hope you are enjoying your Instant Pot! I’ve had this issue intermittently as well. I’ve typically used water instead of broth (We made “corn meal mush” for breakfast using just water when I was a kid. ), so maybe that’s part of the problem, but I haven’t done enough tests to know for sure. The couple of times I used broth seemed to fare better. I’m also using regular corn meal instead of “polenta” (if that’s even an ingredient). Can I double this recipe?id like to make it for Chrismas eve dinner. Making it in the instant pot would b a huge saver! Sure! Just make sure the mixture doesn’t come up more than halfway up the side of the pot, so, no more than 3 quarts total. You may also want to add another few minutes to the natural release to make sure the pot is safe to open (more food takes longer to depressurize). I”ve made this a couple times–it’s so convenient. But, I boil my water first, add bouillon, then proceed to cook the polenta. It took forever to boil the water on the saute setting! My only question is–my polenta was a little grainy. I’m not sure if this is because I’m used to instant polenta, that’s already super-processed, or if maybe it needs to go a little longer? Any thoughts? Either way, this is so convenient, I’ll keep coming back to this recipe for sure. Your polenta may be coarser than mine. Definitely worth a shot to cook it for a few minutes longer! 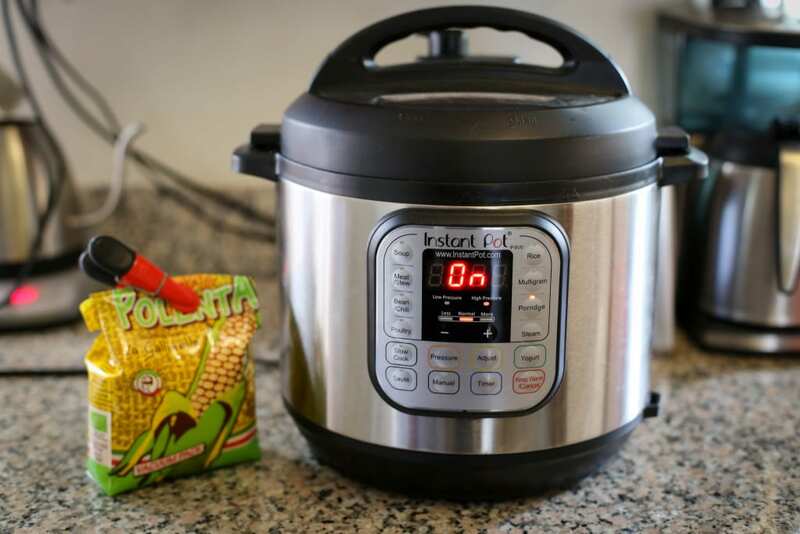 I just got my Instant Pot with the intention of cooking polenta (or corn meal mush as we called it in our youth). As many of you know cooking polenta on the stove top is an arduous and dangerous endeavor. The bubbling lava like mass is sure to jump out and burn you; so I rarely made it. I am happy to say that I had a 100% success rate with this recipe. I like to pour mine into decorative molds for extra interest. As children, Mother would chill it in a loaf pan slice it up, fry it, and serve it with butter and syrup for breakfast. As an adult I use it in my Italian recipes. Made as written(veggie broth in lieu of chicken, extra virgin olive oil and omitted butter) and was rewarded with rich, creamy deliciousness. Allowed to cool in a medium pyrex dish and cut into squares and browned as recommended. Topped it with the Pressure Cooker Mexican-style Zucchini and Poblano recipe from Two Sleeves and had a fantastic vegan dinner. Thank you for the fantastic and simple recipe! For my first attempt at IP Polenta I chose this recipe for its simplicity. I used vegetable broth and Parmesan cheese and followed the method described. It came out perfectly! No burning, no scorching and nice creamy texture. Next time I might reduce the liquid a bit and try chicken broth instead. Overall, very pleased with this recipe. I tried this in an 8 quart instant pot (Duo80) and it came out beautifully. It seemed a little watery at first but I stirred it together and poured it out into an 8”X 8” casserole to cool – scraped a little out into a bowl for me to taste – delicious and firm almost immediately. Just a great recipe – thank you so much. This went to burn almost instantly when I put the lid and set for 8 mins…how can I fix this? Really disappointed! I’ve never gotten a “burn” message when making polenta. You might be using a less coarse-grained variety than me, which means more starch will release quickly and may scorch on the pot bottom. I would try using a coarser grain, or adding more water or broth. I hope that helps! When frying, can anyone tell me how to minimize the “spitting”?